Throwback Thursday examines films from the past—“classic” films that might not be in the current cultural zeitgeist but can still be important in some aspect. There’s a lot of coming-of-age quest films in the world. However, there are a lot fewer all-ages fantasy versions of those films. Along the lines of The Princess Bride, which I’m going to assume most people reading this column can quote eminently, there might be a lesser-known film that you should check out. 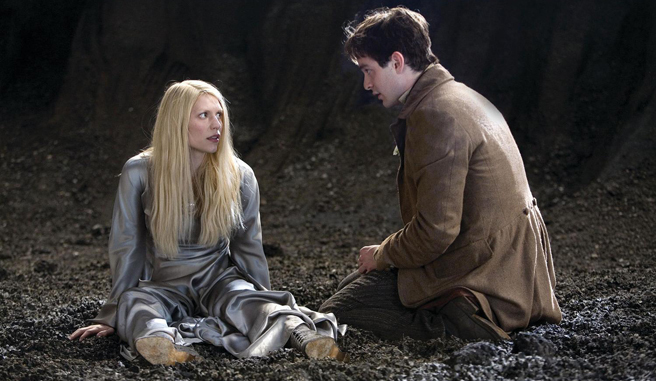 That film is 2007’s adaptation of the Neil Gaiman novel/comic Stardust. The film didn’t make a lot of money at the box office when it was first released, and it has silently slipped into a quiet cult status. When I introduce my friends to it they immediately latch on and love it, even running out to buy the original novel, kicking themselves that they hadn’t seen it sooner. Which is surprising considering how many Gaiman fans there are out there and how much people love movies like The Princess Bride. The poster sure didn’t help in the marketing department. While it isn’t quite as whimsical as The Princess Bride, Stardust has the hero, Tristan, journeying on a quest for true love. Stardust takes an interesting angle on that and sets it as Tristan embarking on his journey based on what he thinks is true love, but over the course of the adventure he realizes what he thought he wanted isn’t the same as where he is at the end of it. It’s a little Rolling Stones: you can’t always get what you want, but you might find you get what you need. 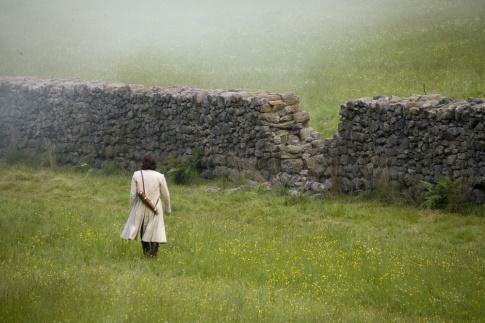 On the way he meets all sorts of characters that weave in and out of the plot and resolve their own story lines as well. All quests start with that first step into the unknown. Most of the time, for me, the leads in a movie like this aren’t nearly as appealing as the ancillary characters. For example, in The Princess Bride, Wesley and Buttercup are great and all, but it’s Miracle Max, Valerie, Vizzini, Fezzik, and Inigo Montoya that are the folks to watch. 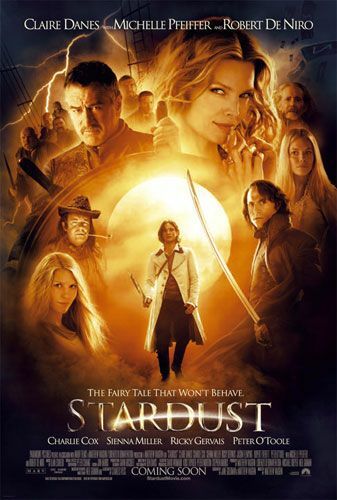 Stardust has some great background characters as well: Robert De Niro as Captain Shakespeare, Michelle Pfeiffer as Lamia, Ricky Gervais as Ferdy the Fence, and a number of guys as various princes of Stormhold, including Mark Strong, Jason Flemyng, and Rupert Everett, to name a few. But the leads also stand out and grow. Charlie Cox does a very underrated job as Tristan, playing him from a bumbling boy to a learned adventurer. His whole physicality changes over the film, which is even more amazing when you find out the film was not shot chronologically. Cox has to remember exactly where Tristan is on his journey at all times and base his physicality on his world experiences. Rounding out the other side of the ingenues is Claire Danes. Her speech is still a little affected in faux British from her time in Romeo and Juliet, but her character is completely different from that. She plays Yvaine, a fallen star. And how do stars act when they’re knocked out of the heavens? Exactly how you’d expect. Very cold at first and then warming to this new world and its inhabitants. Danes goes through about as big a change as Cox does, but in her the physicality is primarily kept to her face and eyes. Eye acting also isn’t easy. There are enough dead-eyed Hollywood starlets in the world; Claire Danes is definitely not one of them. 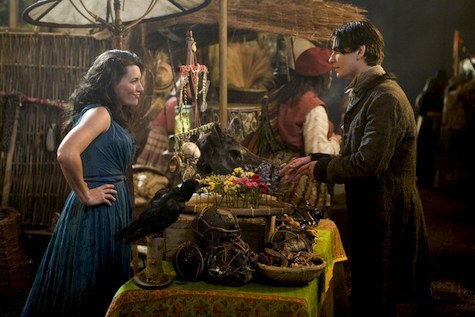 Yvaine and Tristan in a fantasy meet-cute. Coming off the indie success of the gangster/heist film Layer Cake with Daniel Craig, Matthew Vaughn did a complete 180 in directing this. It’s tonally and visually different. Where Layer Cake had an almost washed-out look to suit the characters, Stardust practically leaps off the screen with it’s vibrancy. It’s a gorgeous film, and take note of the costumes. They fit the world and look lived in, without looking too glamorous or Renaissance-y (if that’s not a word, it is now). Bartering for goods at the market. It’s a great film for a family movie night, date night, or just curling up on the couch by yourself, fixing a cup of hot cocoa, and blanketing yourself in. It’s a feel-good movie that cast a spell on me, and I hope it can do the same for you. Seriously, she will cast a spell on you. It might not be a happy spell, but still a spell. This film can be found on both Blu-ray and DVD. It is currently available via Netflix rental and streaming right now, but streaming offerings change frequently, so keep an eye out. Feel free to discuss further in the comments below; just keep it respectful. Where Does Tomb Raider Fall on the Video-Game Movie Scale?